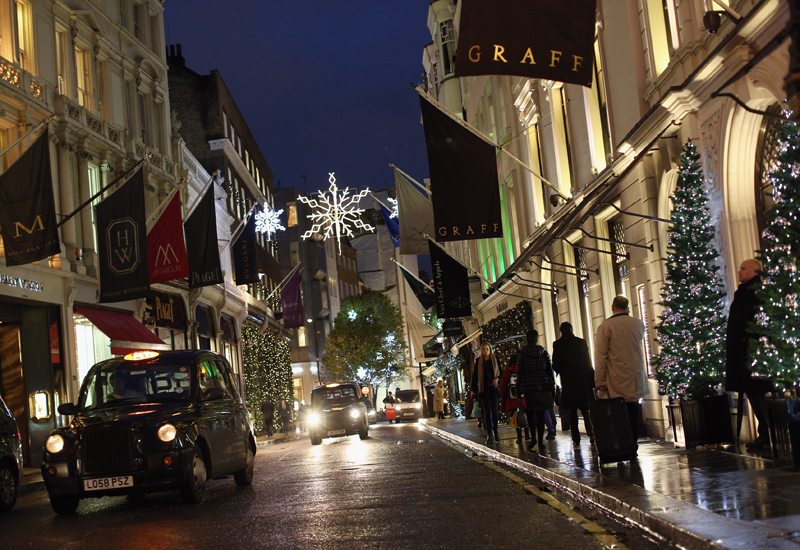 UK watch retailers entered the festive trading period on a strong footing as figures from retail analyst GfK showed that watches for the year to October 2012 were up 2.22%. 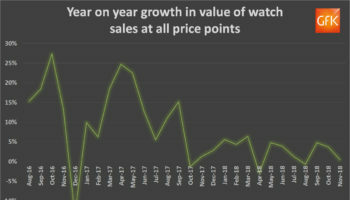 The year to date figures, which were the most recent available at the time WatchPro went to press show a slight rise is sales values for the 12 months to October. 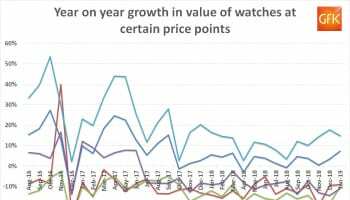 Gents’ watches had a stronger year than ladies, with sales values for the 12-month period up 3.73% compared to a rise of just 0.42% for ladies watches. Unisex watches, meanwhile, did not have a strong year with sales dropping 9.84% in value. 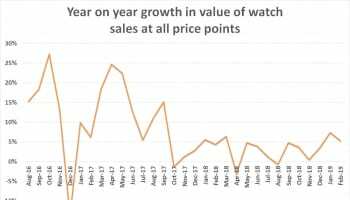 Another growth sector for the year was children’s watches. Data from GfK showed this as a sector on the rise over the course of the year as sales values showed growth of 2.86%. During 2012 a number of watch brands developed lines for children, including Jo For Girls, a children’s jewellery brand that branched into watches for the first time. Its colourful range of quartz watches for girls, designed by the brand’s founder Linda Lambert, launched at IJL. Peers Hardy, meanwhile, announced last month that it has signed a licensing deal with Sanrio to create a line of children’s watches featuring characters from Roger Hargreaves Mr Men and Little Miss books. It will also create clocks and gifts under the licensing agreement. Peers Hardy brand Ice-Watch also took out a line of watches for children, adapting its F*** Me I’m Famous collection for the underage market, rebranding it as Love Me I’m Famous. In price sectors, it would appear that the luxury end of the market enjoyed the most growth in the UK. 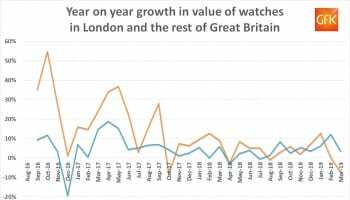 According to GfK’s data, sales of watches priced at £1,000 or more delivered the highest growth, with sales values up 7.17% in the 12 months to October. This was followed by watches priced between £100 and £500, which delivered sales value growth of 1.8%. 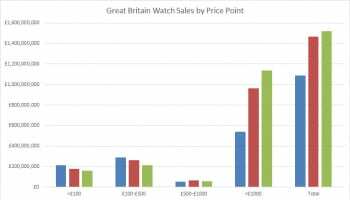 Price sectors hit with negative figures were watches priced £100 or less, for which sales dropped 4.44% in value, and watches priced between £500 and £1,000, which registered the biggest drop of 10.95%. Watches with leather straps enjoyed a strong year, with sales up 10.17% in value over the period. This rise was impressive compared to growth figures delivered by metal bracelet watches, which registered an incremental rise of 0.94%. The popularity of ceramic watches slipped year on year, with sales growth in decline, dropping 1.14% in the period. These figures from GfK only capture sales up until October, leaving out the boom festive months of November and December, which for many watch retailers can still account for up to 40% of annual turnover and set the agenda for 2013 in terms of buying budgets. As WatchPro went to press retailers were still scrabbling for last-minute festive sales, with feedback pointing once again to a Christmas rush that would come later than in previous years; a trend that has been increasing over the past few years as economic instability has left many shoppers unwilling to spend large amounts of cash on presents in advance. Many watch brands invested heavily in consumer advertising in the run-up to Christmas 2012, with many investing in TV advertising for the first time. Ice-Watch sponsored ITV dating show Take Me Out (below) with its timepieces and related show Take Me Out: The Gossip on ITV2 with its range of Ice-Phone products. Distributor Peers Hardy said that the marketing move led to a doubling of sales at some retailers in the UK over the period the ads were on TV. Seiko ran a UK TV ad campaign pushing its Sportura line of watches. The intensive campaign led to the watches being shown on a wide selection of TV channels 2,800 times in the run-up to Christmas, equating to 24 hours of exposure. Citizen also hit the pre-Christmas consumer marketing hard with 3,200 30-second adverts on TV, major ad campaigns at 24 London Underground stations and shop-front advertising in 10 shopping centres across the UK that the brand estimates would have been seen by 10 million. This article was taken from the January 2013 issue of WatchPro, guest edited by Nick and Giles English of Bremont. To read the magazine online, click here.